St Lucie Jewelry and Coins address, phone, website, hours of operation, and more. 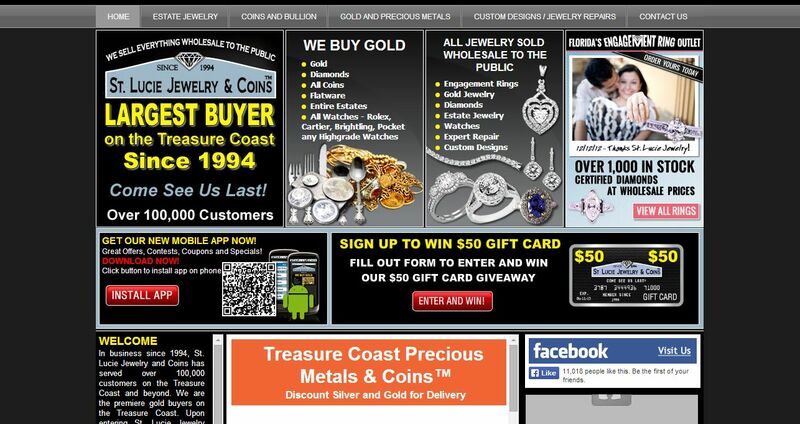 In business since 1994, St Lucie Jewelry and Coins has served over 100,000 customers on the Treasure Coast and beyond. We are the premiere gold buyers on the Treasure Coast. Upon entering St Lucie Jewelry and Coins you will notice a vast selection of Jewelry, Gold, Silver Coins, and Watches in a friendly, comfortable atmosphere. Our expert staff can help you with any questions you have whether you’re buying or selling. Our large assortment of unique and unusual jewelry is unmatched. We also have vintage and estate jewelry available, as well as, new jewelry, engagement and wedding rings. A large selection of designer jewelry and designer watches are also available.